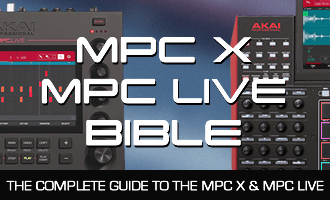 MPC-Samples.com is proud to announce the release of ‘The MPC X & MPC Live Bible’, MPC-Tutor’s complete hands-on tutorial guide for Akai’s new generation of standalone touchscreen MPCs; the MPC X and MPC Live! Packed with nearly 500 pages of MPC beat making tutorials and projects, the book focuses on learning how to control the MPC using the touchscreen, Q-links, dials, buttons and pads, be it 100% in ‘standalone’ mode or connected to your computer in ‘controller mode’. Plus many, many more pro tips, tricks and shortcuts! Each tutorial is carefully written in an easy-to-follow, step-by-step style and includes hi-res screenshots, all recommended parameter settings and all the files and samples you need to recreate each project in your MPC. The book was written for the latest 2.0.3 firmware and will continually receive additional updates to reflect new OS features added by Akai in the future (customers will receive an email alert whenever a new update to the book is available to download). can you tell which mode helps me speed up a sample on the mpc x. .